What makes hazy IPAs hazy: yeast, hops, malts, or all three? Ask Kate About Beer: How do hazy IPAs get hazy? What makes hazy IPAs hazy? Are they unfiltered? It is the kind of hops the brewers use? Or the yeast? You probably wouldn’t have asked your question 10 years ago. Until recently, American IPAs were pretty much all clear, as in, you could see through the amber- or golden-colored liquid in your glass. (I’m distinguishing this from Zima clear, obviously.) It was considered a sign of proper brewing technique to make a clear IPA: “You can read a newspaper through this!” would be a beer judge’s highest praise in terms of an IPA’s appearance. But that all changed when a few rogue brewers, mostly in Vermont and New England, started brewing IPAs that had a bit of a haze to them. They weren’t doing this on purpose to create a new trend—though that’s exactly what happened—they just felt that unfiltered IPAs left more aroma and flavor in the glass. Unknowingly, they’d started a craze that’s since swept the country: Hazy or New England-style IPAs are everywhere now. And because there are thousands of breweries making them, there are multiple methods of achieving the haze. Whereas some breweries who make less-than-clear IPAs (The Vermont Pub & Brewery, The Alchemist, Hill Farmstead, Grimm Artisan Ales) weren’t aiming for haze in and of itself, some breweries now seem to be in an arms race to create the most opaque hop bombs out there. To achieve haze, brewers can manipulate the basic ingredients in beer: yeast, malt, and hops. (Water is the primary ingredient in beer, but it’s not super important to your haze question.) There are urban legends of brewers adding all sorts of crap to their tanks in pursuit of haze—flour, fruit pectin, etc.—but hardly any are willing to admit to that. For the most part, breweries are just working with beer’s classic ingredients in new ways. These are the basics: Yeast are the fungi that ferment sugar into alcohol; malt are the grains like barley or oats that supply that sugar; and hops are the flower of the humulus lupulus plant that give IPAs their flavor. Here’s how these ingredients can be used to make haze. Certain yeast strains stick around. After ale yeasts are done chomping on the sugars in beer, they die and fall out of suspension. (Tragic, right?) This process is called flocculation, and it refers to the spent/dead/no-longer-with-us yeast settling to the bottom of the fermentation tank. When brewers want to achieve a clear beer, they remove these yeast—RIP—which helps clarify the beer. So if a brewer wanted to achieve some haze, they might use a less flocculant yeast strain. This means the yeast don’t fall out of suspension as quickly; instead, they sort of hang around in the fermented beer like your unemployed brother who still lives in the basement. 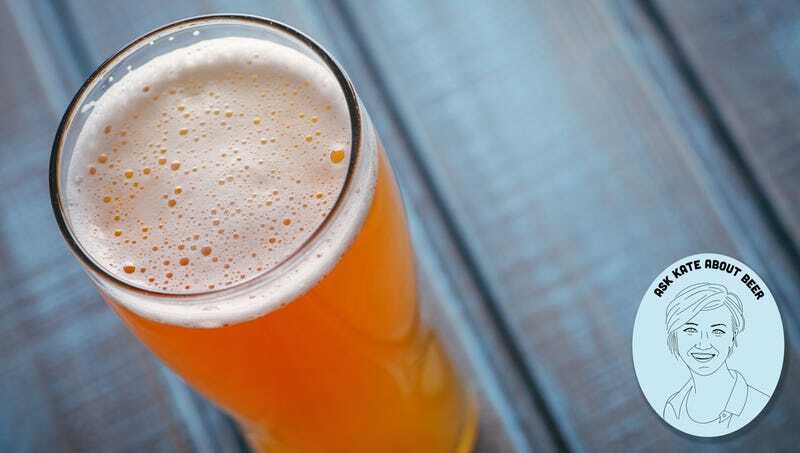 Some yeast strains that brewers favor for New England/hazy IPAs are less flocculant and produce not only haze but also fruity flavors called esters, adding to the “juicy” flavor and aroma often associated with these IPAs. And then they mingle with hop bits. Brewing hops come in multiple forms: pellets, whole cones, powder, even hop oil. Pellets are most common in professional brewing, and they can leave a bit of leftover hop particles in beer once they’re added to the recipe. Back in the day, brewers would have filtered this out to achieve clearer results. But now, brewers are leaving a lot of of that hop matter in the liquid to enhance its flavor and aroma. When you filter out the hop bits, the thinking goes, you filter out some hop goodness, too. Brewers are also favoring dry-hopping, or adding hops later in the beer-brewing process after the unfermented liquid has already been boiled. This means the hops release fewer of their bittering compounds into the beer, and more of their flavor and aroma compounds come to the fore. A side effect of this also happens to be—drum roll—haze. Lastly, there’s an emerging area of research looking into biotransformation, which is basically the idea that the combination of hop particulates and brewers’ yeast is greater than the sum of their parts. To keep it simple: A chemical reaction occurs when suspended yeast and hop oils come into contact that transforms the flavor and aroma compounds into something entirely new. It’s fascinating stuff, and may help explain some of the unexpected fruity and even candylike flavors that are these new IPAs’ calling cards. Malted grains provide the sugars that yeast snack on and transform into alcohol, but they also add proteins to the mix. Usually, brewers use a base of mostly malted barley, but other grains like oats and wheat have higher protein contents which make for a cloudier beer appearance and a “soft” body. Think of a hefeweizen or other wheat beer; all the wheat in the recipe gives it a cloudy look and a “chewier” body. Some brewers are now adding a bit of wheat or oats to hoppy beers like IPAs and pale ales to achieve softness on the palate and, yes, a little haze. It’s a pretty subtle difference, honestly, as wheat or oats usually still make up just a small percentage of the overall grains used, but combined with fruit-forward hops and a less-flocculant yeast, it can make for a pillowy, juicy, fruit-bomb of an IPA that seems to be all the rage these days. I’m not here to tell you whether hazy IPAs are good, bad, tasty, or just a passing fad. What matters is that you drink what you like. Personally, I enjoy a well-constructed, thoughtful IPA whether it’s hazy or not. But if I really had to pick a desert island beer, you’d find me with an unfiltered pilsner.